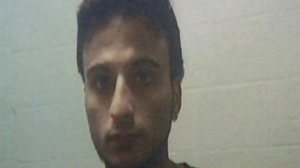 Hosam Maher Husein Smadi, a 19-year-old Jordanian citizen who has been living and working in Italy, Texas illegally, was charged with "attempting to use a weapon of mass destruction," authorities said. Police say he allegedly placed an inactive car bomb near Fountain Place at 1445 Ross Avenue in downtown Dallas. The FBI concluded two sting operations in the last two days that culminated with the arrests of a pair of terrorism suspects who believed they would be blowing up buildings in Dallas and Springfield, Ill. Although not connected, officials say the FBI and Justice Department had to coordinate the timing of the two cases so that arrests would not cause suspects to get cold feet with their intention to conduct their operations. Today, shortly after noon in Dallas, FBI agents swooped in on Hosam Maher Husein Smadi, who allegedly placed what he believed to be explosives in a car bomb near Fountain Place in downtown Dallas. Smadi, 19, a resident of Italy, Texas, is a citizen of Jordan and was in the U.S. illegally. FBI agents became aware of Smadi on Internet chat rooms. According to an FBI affidavit filed by Thomas Petrokowski, head of a counterterrorism squad in the FBI's Dallas field office, "Smadi stood out, based on his vehement intention to actually conduct terror attacks in the United States." Just 24 hours earlier, FBI agents in Springfield, Ill., arrested and charged Michael Finton with attempted murder, after he planted what he thought was a one-ton bomb outside Springfield's federal courthouse. Finton, aka Talib Islam, drove a van that he believed was carrying nearly a ton of explosives and parked it in front of the courthouse. Then, the FBI says, Finton "got out of the van," according to court documents and jumped into another car and dialed a cell phone to remotely detonate the bomb. Finton's arrest was a sting operation, the explosives were fake. Finton was arrested and has been appointed a lawyer from the federal defenders office in Springfield. In Washington Thursday, David Kris, the assistant attorney general for the National Security Divsion, said of Finton's case, "Fortunately, a coordinated undercover law enforcement effort was able to thwart his efforts and ensure no one was harmed,"
On chat rooms and jihadist Internet forums, Smadi consistently stated his commitment to attacks and violent jihad. According to the affidavit, after Smadi repeated these comments, an FBI undercover employee made contact with the young Jordanian and had about 10 communications with him. "During those interactions, Smadi made clear his intention to serve as a solider for [Osama] bin Laden and [al Qaeda], and to conduct violent jihad," according to the FBI affidavit. FBI counterterrorism agents determined that Smadi was a legitimate threat and began to establish a sting operation to encounter him. The FBI used a separate undercover employee to pose as a senior member of an al Qaeda "sleeper" cell. In a statement, the FBI special agent in charge of the Dallas Field Office, Robert Casey, said, "Smadi made a decision to act to commit a significant conspicuous act of violence under his banner of 'self Jihad.'" In March 2009, the FBI undercover employee posing as the senior member of the sleeper cell spoke with Smadi. In a March 19, 2009, communication, according to the FBI affidavit, Smadi said, "I truly say it is my dream to be among God's soldiers, first for the support of Islam and my beloved Sheik Usama. I don't know what is in me but I love him as I love my father." Smadi also allegedly said, "The point is that thousands of Muslims have been killed in Gaza and the hand of Jews-the-dogs and the silent disloyal backsliders." In a discussion 10 days later, Smadi allegedly said, "We shall attack them in a manner that hurts, an attack that shakes the world." According to the FBI affidavit, FBI undercover employees had about 55 conversations with Smadi from March until his arrest. Defense lawyers for Smadi will likely try to say he was entrapped. In an April 4, 2009, communication, the FBI undercover employee told the young Jordanian, "The operation we are planning will be, with God's help, a big painful attack that requires the participation of many brothers like you." The undercover also tried to counsel Smadi: "You may perform jihad in a less dangerous way, such as jihad using your money or in training yourself to avoid sins." Agents also asked Smadi in the April 4, 2009, communication to consider "What jihad do you seek?" Three days later, Smadi told the undercover, "I have chosen to be Mujahid with my self, blood, soul and body. I shall support Osama. I shall kill and behead the backslider operatives in the Levant and land of Muslims." In the next month, the FBI began to meet with Smadi in person in hotels in and around Dallas, according to the FBI affidavit. In a May meeting, Smadi told his FBI handler, "I want to destroy...targets...everything that helps America on its war on Arabs." In meetings in late June, Smadi discussed targeting military recruitment centers, such as was done in Little Rock in a June 1, 2009, shooting which killed an Army private. He also allegedly considered banks and economic targets. As their meetings continued, the FBI asked Smadi to consider his role in jihad on July 4. The undercover told Smadi, "If you have any hesitation, now is the time to change your mind." Smadi allegedly replied, "This is my decision. I hope you accept me as a brother amongst you as our path is one." By July, the FBI alleges Smadi had chosen to target the office building at Fountain Place in Dallas, which held offices for Wells Fargo. By August, the FBI alleges that Smadi was indicating he wanted to undertake his attack on the 9/11 anniversary. On Aug. 26, 2009, at a hotel meeting in Dallas, Smadi allegedly told the FBI undercover, "I want to bring down the whole building." The two discussed using C-4 and blasting caps to design their bomb, which would be placed in a vehicle. According to the FBI, Smadi allegedly described placing the bomb would be "a wonderful thing. I want to enter to plant the bomb." FBI agents and the undercover employee posing as a member of the al Qaeda cell constructed an inert device in a 2001 Fort Explorer. On Sept. 20, Smadi allegedly said, "Let the drums of victory be struck in our holiday. May this only be the beginning." The FBI affidavit notes that on Thursday, Smadi along with the undercover made their final preparations for planting the bomb with Smadi inspecting the device in the SUV. "Smadi alone and believing himself to be in possession of a weapon of mass destruction, did drive a vehicle containing the [Bomb] through the streets of downtown Dallas toward his planned target location. He entered the parking garage directly beneath the Fountain Place building," the FBI affidavit alleged. "Smadi then attempted to ignite and detonate the explosive device by setting the device's time and flipping the power switch on the explosive device." Smadi, after meeting the FBI undercover official, "then dialed the cell phone which he believed would detonate the explosive device." At that point, FBI agents recorded the call being placed and moved in to arrest Smadi. The FBI declined requests for interview out of Dallas Thursday evening but in the paper statement, Special Agent in Charge Casey said, "This case serves as a reminder of the continuing threats of terrorism we face as a nation and the FBI's resolve to meet those threats. The arrest of Smadi is not in any way related to the ongoing terror investigation in New York and Colorado." Attorneys for Smadi and Finton could not be reached Thursday evening. Smadi is due to have an initial court appearance Friday in Dallas.